Over the last year Anglian Home Improvements has championed the need for assistance from Local and National Government by supporting the Glass and Glazing Federation (GGF) Petition for a National Window Scrappage Scheme. This would have given homeowners some additional financial assistance in improving their homes efficiency through replacing current old windows with new, more efficient replacements. 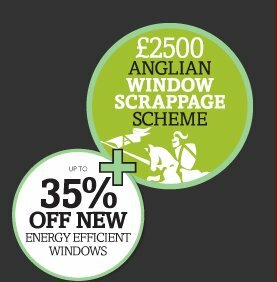 One of Anglian’s ongoing promotions is our very own scrappage scheme, financed by Anglian where we give homeowners up to £2500 for their old windows as payment towards new, more efficient double glazing. Since the beginning of this promotion the country has voted for change through the general election and we, the country are now starting a new era of Government control and setup, we are governed by a Coalition Government for the very first time. With new leaders come new ideas, policies and direction. In June the Chancellor delivered the budget statement to the House of Commons. This set out a detailed plan on how the new Coalition will counter the current huge national debt we, as a country, find ourselves burdened with. 1. The Budget sets out a comprehensive and credible plan to deal with the nation’s debts and significantly accelerate the reduction in the budget deficit over the course of this Parliament. Deficit reduction and ensuring economic recovery are the most urgent issues facing the UK and the Government’s top priorities. 2. The Prime Minister has pledged to make this the greenest government ever. The Government believes that climate change is one of the most serious threats that the world faces. This includes reducing the Government’s own emissions by ten per cent between mid-May 2010 and mid-May 2011. 3. The Government is committed to playing its part in moving to a low-carbon economy. This transition will change the shape of industry, growth and jobs in the future. As part of this, the UK needs £200 billion of investment by 2020 to provide secure low-carbon energy. This will require reform of the energy market and action to attract additional private sector funding. assessing how the energy tax framework can provide the right incentives for investment, alongside wider market reforms. In the autumn, the Government will publish proposals to reform the climate change levy in order to provide more certainty and support to the carbon price. Subject to consultation, the Government intends to bring forward relevant legislation in Finance Bill 2011.
establishing a Green Deal for households through legislation in the Energy Security and Green Economy Bill, to help individuals invest in home energy efficiency improvements that can pay for themselves from the savings in energy bills. The Government will also continue to progress work on creating green financial products to provide individuals with opportunities to invest in the infrastructure necessary to support the green economy. aviation taxation. The Government will explore changes to the aviation tax system, including switching from a per-passenger to a per-plane duty, which could encourage fuller planes. Major changes will be subject to public consultation. The plans seem fairly comprehensive but only time will tell on how effective these announcements become and most importantly what effect they have on the environment. Anglian Home Improvements, formerly known as Anglian Windows. Raising the standard of home improvements since 1966.